If you enjoy entertaining or spending time outdoors, having a kitchen in your own backyard or patio area may be a good investment for your home. Whether you enjoy hot food off the grill, basking in good weather or breathing in fresh air, having an outdoor kitchen gives you even more reason to enjoy your backyard. Before you get started, creating an effective design plan can help you get the results you want. With any kitchen design, it is important to consider the type of food will be prepared in it. While some home cooks may stick to simple grilled meats and vegetables for smaller crowds, others may prefer a kitchen with the capabilities of preparing a wide variety of culinary offerings in their outdoor space. With all the design options available, you can fill your kitchen with all the equipment you need to prepare the food you enjoy. While it may be fun to fantasize about your ideal outdoor cooking area, the reality is that there are some limitations that may affect the design you choose. One major factor is the space you must work with. 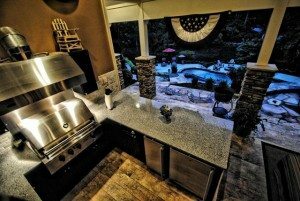 If you have a smaller patio, a simple island with grill set-up with a few barstools may work best. If you have a significantly larger yard, a fully-functional outdoor kitchen surrounded with plush seating may be more practical. Another important consideration is the number of people you plan to accommodate in your space. If you’ve decided to move forward with your plans to create the most functional space for you or the outdoor cook in your life, it may feel overwhelming to design one yourself. Luckily, by consulting a professional in this field, you will learn that there are many classic designs that you can use as the inspiration for your own outdoor kitchen, or you can work together with a contractor to design one that’s uniquely your own.